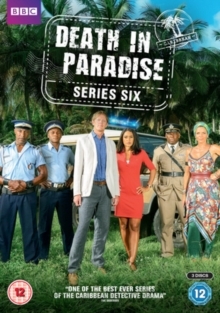 The entire sixth series of the BBC comedy drama set on the Caribbean island of Saint Marie. DI Humphrey Goodman (Kris Marshall), with the assistance of DS Florence Cassell (Joséphine Jobert) must solve the crimes which continue to plague the idyllic island. In this instalment, the duo investigates the death of a scientist on the side of a live volcano, the murder of a hotel owner and the assassination of the local cricket club president. The episodes are: 'Erupting in Murder', 'The Secret of the Flame Tree', 'The Impossible Murder', 'Stumped in Murder', 'Man Overboard: Part 1', 'Man Overboard: Part 2', 'In the Footsteps of a Killer' and 'Murder in the Polls'.